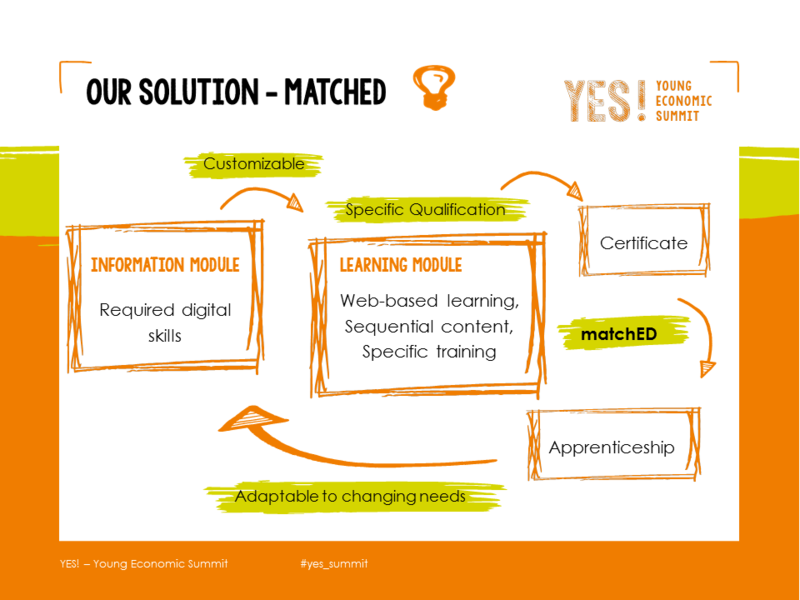 matchED: Matching Education and Digitalization | The Forum Network, hosted by the OECD: Shape ideas. Shape policy. Shape the Future. The YES! – Young Economic Summit is a joint project of the ZBW – Leibniz Information Centre for Economics and the Joachim Herz Stiftung. 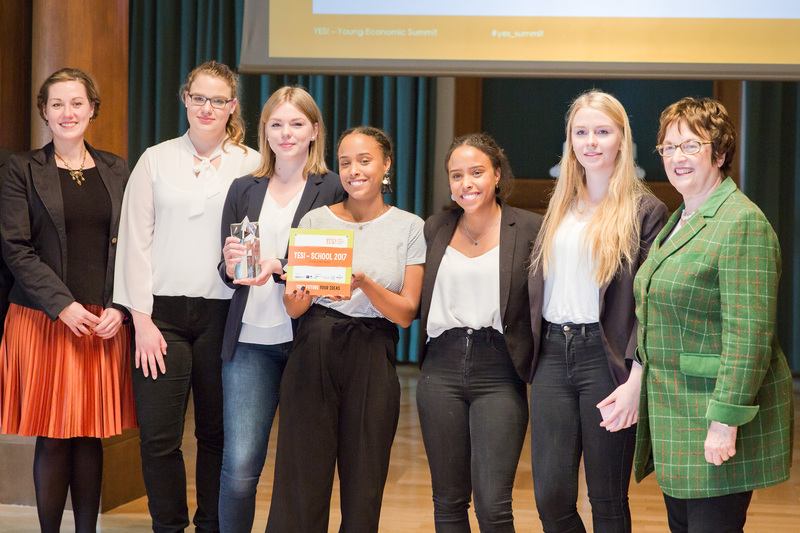 matchED was a project presented at the 2017 summit by students from the Richard-Hallmann-School in Trappenkamp, Germany. What can be done to provide students with the digital skills that will be required by their future employers? Self-trained, lifelong learning supported by a digital platform may be the answer. The digitalised working life leads to new and instantly changing requirements for employees. But when and how do employees have the chance to acquire these necessary digital skills? There is no real answer to that question because often employees are not digitally qualified or up-to-date. The European Commission 2017 report, ICT for Work: Digital Skills in the Workplace, examined the impact of information and communication technologies on jobs in the digital age. It showed that though 80% of the companies surveyed expected fundamental digital skills of their employees, only 12% of employers try to educate their employees actively. After leaving school, graduates usually do not have the opportunity to acquire the digital skills that are essential for their future career; on the other hand, employers are not able to educate their employees who can barely can make up the deficit. This lack of competences then has a negative impact on the working process as a whole. To prepare the next generation for the digital change and to facilitate career entry for graduates, we want to design a platform under the name matchED - Matching Education and Digitalization. The web-based platform combines a learning module for students with an information module for employers. In that way, the lack of qualifications in the labour market can be decreased from both the students’ and employers’ sides so that graduates can gain skills matching their aspired career. Often schools cannot offer the necessary hardware and facilities, so we chose to design a programme that can be taken by all students using their own or publicly available devices. For four terms, students in years 11 and 12 complete the programme working from home, since self-dependency and the willingness to learn are important skills in the digital age. However, they are monitored by teachers who control the process and test the students at the end of each term. The information module is designed for employers who are looking for a qualified apprentice. Employers assign the desired digital skills for different apprenticeships or jobs and can even specify the minimum score that students need for the application process. Students, or those beginning their working life, then have the opportunity to design their individual training regime in the programme tailored to the profession or company they want to apply for. On top of digital basics, every student chooses the skill set best suited for their future career. The O-Net or the OECD Skills for Jobs Database are examples of resources that could be used to create job profiles. The counterpart of the information module is the learning module, which is customisable to the demand of the employers. This is where the students learn online. Receiving a certificate upon successful completion of the programme allows students to document their skills during the application process. The students have to complete different tasks in every competence cluster to gain points. These competencies are non-cognitive and sequential skills in order to internalise the learning contents. There are fundamental tasks, such as word processing and research, which everyone has to complete, as well as additional tasks that further develop the topics for extra points. In this way, students can learn skills depending on what they need for their future. Our alumni newsletter will update former students about changes in their field and, to stay current, they can come back and refresh their skill set according to their needs. This is also a personalised kick-off for lifelong learning. Given our current demographic trend, “lifelong learning” is of vital importance for most OECD countries. The first term in grade 11 includes searching, processing and saving information safely. In the next term, the students learn everything about producing and presenting content. Year 12 will start with data protection, privacy and hardware security. In the last term, everyone who takes part in the programme can decide what additional skills they want or need for their future career. These include communication, problem solving and analysing and interpreting information. With matchED, the issue of an unprepared and not digitally qualified generation would be solved as every graduate would acquire the skills for their individual future job. Only within an official framework and with professional support can the programme and its certificate reach professional status and facilitate a successful career entry.